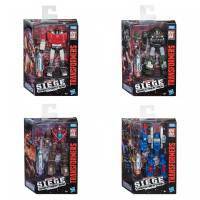 Thanks to UK seller, In Demand Toys, we have our first look at WFC: Siege Wave 2 Deluxes and Battle Masters in-package. Deluxe Class Wave 2 includes Chromia, Ironhide, Sixgun, and Prowl. Battle Masters Wave 2 includes Aimless and Pteraxadon. 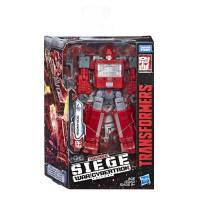 Site sponsor The Chosen Prime has listed Transformers WFC Siege Wave 1 Voyager Class figures Optimus Prime and Megatron in stock. 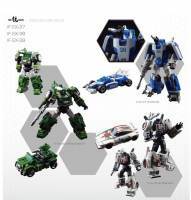 Pre-orders for Deluxe Class Wave 1 (Sideswipe, Hound, Cog, and Threadshot) are due next week. In addition they also posted some new stock images of the figures. Be sure to check for listings from your preferred sponsor by using one of the links below. 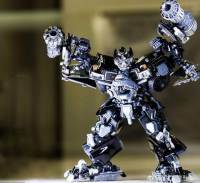 With MPM-06 Ironhide’s release just around the corner we are finally getting some in hand pictures thanks to Notrab. If you want to add Masterpiece Movie Ironhide to your collection be sure to preorder him through one of our several site sponsors. 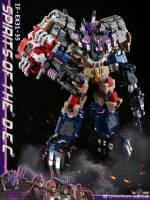 Iron Factory has updated their Weibo with new colored images of their upcoming set: Fang of Tyranny. This set homages the Decepticon Coneheads Thrust, Ramjet, and Dirge in legends scale. The set will include the last build-a-figure part for their Clone figure which homages Sunstorm (the other parts are included with Wing of Tryant Blue and Violet). The set retails for around $90 and should be out soon. Enjoy the pictures after the jump! 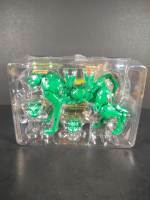 Thanks to board members Primal Sabbath and Type-R, we get to have an interesting look at Masterpiece Cheetus in green prototype plastic. Most notably we get a look at the cancelled long range communicator device that Rhinox made in the first season of the series. Check out images after the jump! Do you wish these accessories made the final cut? Share your thoughts in the discussion.